Salou is a traditionally seafaring city that today is not only the preferred holiday destination for thousands of families from all over Spain and Europe on The Costa Daurada. The Seaside Resort of Salou The Costa Daurada. Salou on The Costa Daurada.is a traditionally seafaring city that today is not only the preferred holiday destination for thousands of families from all over Spain and Europe, but has also consolidated itself as an important residential nucleus on the Costa Daurada and Tarragona seaboard. Camí de Les Pascuales, 1, Salou. £28 Average price per night. First of all, if Salou today is the main motor and basic reference point for the tourism and leisure offer of our coast and the Catalonian seaboard in general, it is because it offers visitors all of the ideal ingredients: safe, well-equipped beaches; urban planning governed by green spaces, design and the architecture of the landscape; a varied leisure and entertainment offer; and quality facilities that have earned the city the name of the Capital of Costa Daurada. Second, Salou is also an ideal place to live. The growing number of inhabitants and families who have chosen to settle in the city over the last few years is proof that the standard of living, the levels reached with regard to services and equipment, and the varied offer of a caring, modern and dynamic city are all powerful attractions. Salou is a tourist and residential city that has consolidated its capital role as the leisure and service centre of the Costa Daurada through the diversity of its offer and the quality and quantity of its tourism facilities. Thus, on the one hand, it presents itself as a holiday destination and reference point, concentrating the majority of the basic tourism industry infrastructure in the Tarragona regions (74 lodging facilities) and acting as a main motor with regard to developing and capitalising on the diversity of the area‘s entertainment and cultural offer. On the other, it is also home to the main agent for regional dynamism, the Costa Daurada’s attraction par excellence: the Universal Mediterranea complex, which consolidates the Salou product and its sphere of influence as the most important leisure centre on the Catalonian seaboard and in the Mediterranean arc in general. The Costa Daurada.mild year-round temperatures; safe, orderly and shallow beaches offering all services and equipment; hidden coves of great natural and scenic interest; an urban design plan that gives centre stage to green spaces, plants, design and the architecture of the landscape; points of historical, architectural and monumental interest; a varied entertainment and leisure offer with highly dynamic sectors (shops and restaurants); and quality facilities have all helped to turn it into the Capital of the Costa Daurada and to earn it the top rating for Family Tourist Destinations in Catalonia. In addition to the large variety of services and alternative activities available at the beaches, there are initiatives and acts for even the most diverse trends, habits and demands of today‘s tourism: the opening of the Yacht Club, the future construction of a coastal route following the coves of Cape Salou, the environmental recovery of the coasts, and the execution of projects within the Plan for Tourism Excellence, which aims to turn it into a singular model for family tourism. Furthermore, the town has also transformed itself into an important residential destination. As a result of the city‘s urban planning project to provide services and equipment, modernise its infrastructures and rezone the territory in order to achieve its re-equilibrium, plans have been implemented and carried out that have opened up the first-residence housing market. This fact, along with the city‘s high standard of living, has played a key role in its spectacular demographic growth, as well as in convincing families from neighbouring towns and abroad (a high percentage of the inhabitants are from other EC countries), attracted by Salou‘s conditions, possibilities and potential, to choose the city as their place of residence. 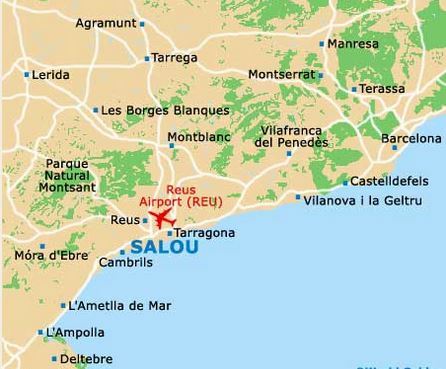 In short, Salou has projected itself as a city that cares about its services and is attentive to its community‘s needs, offering ideal space both to live in and for social and professional development. 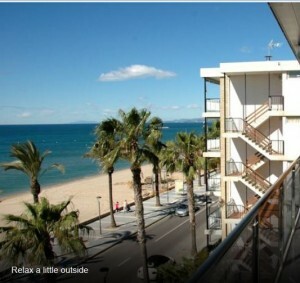 These modern apartments are located on Salou’s seafront promenade, 10 metres from Ponent Beach. The air-conditioned Edificio las Palmas VII apartments feature stylish decor. Lounges include a sofa and dining area while contemporary kitchens have a washing machine, dishwasher, oven and hob. There is 1 twin bedroom and a master bedroom with en-suite bathroom featuring spa bath. Sheets and towels are included. Outside, there is a seafront balcony, perfect for al fresco eating or relaxing. There are several bars, restaurants and shops within 5 minutes’ walk and the Port is just 700 metres away. PortAventura Theme Park is 5.5 km away. The las Palmas VII apartments are 10 minutes’ walk from Salou Train Station and 20 minutes’ drive from Reus Airport. Central Tarragona is 12 km away. We speak your language! 13 Apartments. Salou – Costa Daurada – Spain. The coastal strip on which the city of Salou is located has long been a privileged enclave for human development, favoured for its beaches and coves.The presence of a sedentary population in the area was first seen in the settlements of the early Iberians and ancient Romans. This was the era of the mythical Salauris, traditionally identified with modern Salou. With the subsequent arrival of the Saracens, the region became progressively less inhabited and was eventually abandoned. It was not until the middle of the 12th century, as a part of the Reconquest, that new attempts were made to resettle it. In 1194, a town charter was drawn up for Salou and bestowed by Alfons I the Chaste, upon Ximeno d Artusell. The attempt, however, was unsuccessful. The 13th century was marked by the conquests of King Jaume I, who, aware of the exceptional conditions of the natural port of Salou, concentrated the fleet there that, in 1229, would sail to take Majorca. During the second half of the 14th century, living conditions in Salou became difficult. The war between Peter I of Castile and Peter of Aragon and continuous pirate raids led to another decrease in the population. In fact, it was to ensure the defence of the city’s people and goods against the endless attacks by privateers, that, in 1530, the Archbishop of Tarragona, Pere de Cardona, ordered the Old Tower, today an art centre, to be built. Salou remained a part of the Tarragona prelacy until 1673, when the prelacy ceded certain rights to the nearby town of Vila-seca, thereby initiating a process through which Vila-seca would gradually come to possess Salou and its port. Needless to say, this led to multiple disputes with the neighbouring city of Reus. In 1776, the Santa Maria del Mar Church was sanctified, a modest chapel used for worship by the sailors guild, which, from the middle of the century on, exercised exclusive control over port and fishing tasks. In 1820, the Captaincy and the New Customs Building were built, but in November of the same year, a decree issued by the Constitutional Courts suppressed operation of Salou’s port. Despite the fact that the Lighthouse was inaugurated in 1858, the port’s decadence was already clear. In 1863, the bath houses of the Ponent beach were authorised, and in 1865, operation of the railroad station began. In 1887, the Reus-Salou tram line, popularly known as the carrilet, was inaugurated. In the twenties, construction of the modernist chalets along the Passeig Jaume I promenade was begun, and the first summer residents and tourists began to arrive. In the 60s, Salou began a process of spectacular urban growth leading up to the current tourism phenomenon. 1965 saw the erection of the monument to King Jaume I, a veritable symbol of contemporary Salou. In the 70s, an organised movement with wide popular support promoted the city’s municipal segregation, which culminated in the Supreme Court decision of 30 October, 1989, granting the nucleus of Salou administrative independence from Vila-seca and ordering the Catalonian Autonomous Government to recognise it as an independent municipality. Thereafter, Salou underwent its most significant urban and social transformation, with a drive to re-equip and renew the city’s services and large demographic growth. spain-info. Costa Daurada Salou for large villas, spain-info Costa Daurada Salou for large parties. spain-info Costa Daurada Salou for large wedding parties. spain-info Costa Daurada Salou reunions. 44,51,13 rich,g says no b says yes?,14,28,44,46,52.